The female inflorescences of Humulus lupulus (hops) have long been used in traditional medicine mainly to treat sleep disorders, but also are indicated in neuralgia, states of agitation associated with nervous tension, for their antibacterial, antifungal, antioxidant, anti-inflammatory and chemopreventive, in addition to the food and beverage industry for the production of beer1,2,3,4. The therapeutic properties of hops are well documented both by literature and by scientific studies. Also the Commission E (German Scientific Committee which evaluates and approves herbal medicines based on demonstrated evidence of safety and efficacy) has authorized the use of hops for mood disorders, anxiety as well as sleep disorders. Melcalin Hops contains dried extract of high titration Hops which is particularly recommended in case of insomnia, agitation, anxiety and helps relaxation in stressful situations. Sleep is an essential need for any individual so much that its deprivation may affect biological rhythms. The conventional medical treatment includes pharmacological and psychological approaches, but long-term use of medications can lead to addiction, to issues related to withdrawal symptoms and to side effects. Natural approaches are therefore gaining more and more popularity because they do not have the disadvantages of many medications. Even though they are still investigating what are the active ingredients responsible for the therapeutic effect, it seems that the sedative action is mainly due to the α-acid, 2-methyl-3-buten-2-olo 4,5,7: the mode of action involves an increase in the activity of the inhibitory neurotransmitter GABA by modulation of GABA (A) receptors in the brain8,9,20,24. It has been demonstrated that the hop extract has important effects on circadian rhythms that regulate sleep: it affects serotonin and melatonin 10,11,12. The effects of the extract of hops are comparable to those of melatonin and the hypothermic action of melatonin and of hops extracts may be antagonized by luzindole (competitive antagonist of melatonin receptors) suggesting that the sleep-inducing properties of the extract of hops are mediated by the activation of melatonin receptors 13,14; the active compounds responsible for the soporific action include β-bitter acids, the mircenolo and xanthohumol 10. From what emerges in literature, hop can improve the neuroendocrine response of the CNS through the interaction with GABA receptors, serotonin and melatonin expounding an effective sedative action that modulates the sleep / wake rhythm and helps sleep induction. In the past, hop shoots were also used for the sedative action in treating obsessive behavior, broods, concern and neuralgia. Data demonstrated that the hop extract offers better sedative effect, better pre-anesthesia and anti-anxiety effects compared to diazepam 15. Even the German Commission E has approved its use for mood disorders such as restlessness and anxiety. The extract of Humulus lupulus also exerts an important antidepressant activity being performed by the compounds alpha-acids 16: in preclinical studies, the administration of these compounds has been able to confirm not only the usefulness of hops in sleep disorders, but it is also assumed that such molecules might represent a new class of compounds for the development of natural antidepressants products. According to clinical studies and literature the products made from hops have been found useful alternatives in the management of stress and anxiety of everyday life 17. Hops contains several classes of compounds with anti-inflammatory action 18. The bitter acids are effective against inflammatory and metabolic disorders so much that could be alternative candidates in treating diabetes mellitus, cardiovascular disease and metabolic syndrome 19: recent studies highlight hops’ anti-inflammatory properties which are encountered in lowering the level of C-reactive protein (chronic inflammatory diseases and autoimmune diseases) and with the inhibition of cyclooxygenase 223. Comparing the anti-inflammatory effect of various classes of hop bitter acids including alpha-acids, beta-acids and iso-alpha-acids it has been proven that all three classes of active substances have blocked the production of TNF-alpha, IL-6, inhibited the transcription of NF-kB and the activator protein-1 (AP-1) thus determining the decrease in the expression of genes related to the inflammation11,21. Another class of alpha acids, the Tetrahydro-iso-alpha acids has shown potent effects on inflammatory mechanisms: in rheumatoid arthritis, these compounds have resulted in a decrease of bone demineralization, a reduction in the swelling of the limbs and of the plasma levels of interleukin IL-618. Even other compounds of the Hops have anti-inflammatory effects: the xanthohumol leads to inhibition of production of TNF-alpha (TNF-alpha)22, while the component polyphenols is able to inhibit COX-2 and interleukins IL-6 and IL-8 in a dose-dependent manner23. Hops components also have an immunomodulatory effect since they have been documented increases in the concentrations of anti-inflammatory cytokines such as IL-4, IL-10 and IFN-gamma10. Hops is a plant with multiple properties: sedative and hypnotic, antidepressant, anti-inflammatory, antioxidant and chemopreventive. Hops is a valuable alternative or natural remedy to support the classical pharmacological therapy due to its important activities on the nervous system and anti-inflammatory properties. 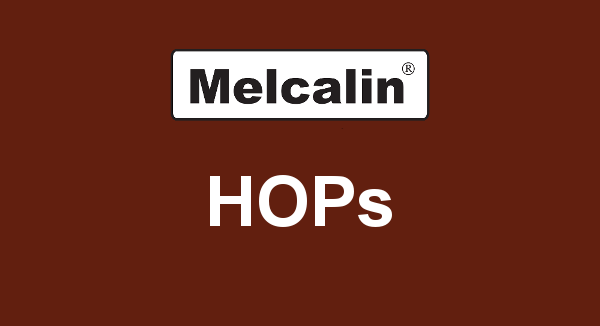 Melcalin Hops contains high titration hop extract, which makes it a valuable support in case of symptoms related to the emotional sphere and connected issues such as loss of sleep patterns and chronic stress. 4 Journal of Ethnopharmacology [2008, 116(3):383-396]. Department of Biomedical Sciences, National InterUniversity Consortium for the Study of Natural Active Principles, University of Modena, Reggio Emilia, 41100 Modena, Italy. Zanoli P, Zavatti M.
6 Acta Physiol Hung. 2012 Jun;99(2):133-9. The sedative effects of hops (Humulus lupulus), a component of beer, on the activity/rest rhythm.Franco L, Sánchez C, Bravo R, Rodriguez A, Barriga C, Juánez JC. 8 Acta Physiol Hung. 2012 Jun;99(2):133-9. The sedative effects of hops (Humulus lupulus), a component of beer, on the activity/rest rhythm.Franco L, Sánchez C, Bravo R, Rodriguez A, Barriga C, Juánez JC. 13 J Pharm Pharmacol. 2007 Apr;59(4):549-52.Hypothermic effects of hops are antagonized with the competitive melatonin receptor antagonist luzindole in mice.Butterweck V, Brattstroem A, Grundmann O, Koetter U. 14 Acta Physiol Hung. 2012 Jun;99(2):133-9. The sedative effects of hops (Humulus lupulus), a component of beer, on the activity/rest rhythm. Franco L, Sánchez C, Bravo R, Rodriguez A, Barriga C, Juánez JC. 16 J Ethnopharmacol. 2005 Oct 31;102(1):102-6.New insight in the neuropharmacological activity of Humulus lupulus L.Zanoli P, Rivasi M, Zavatti M, Brusiani F, Baraldi M.
17 Med Sci Monit. 2009 Nov;15(11):RA256-62. Formulations of dietary supplements and herbal extracts for relaxation and anxiolytic action: Relarian. Weeks BS. 18 Planta Med. 2006 Feb;72(3):228-33.Selective inhibition of COX-2 by a standardized CO2 extract of Humulus lupulus in vitro and its activity in a mouse model of zymosan-induced arthritis.Hougee S, Faber J, Sanders A, Berg WB, Garssen J, Smit HF, Hoijer MA. 19 PLoS One. 2012;7(3):e33858. Tetrahydro iso-alpha acids from hops improve glucose homeostasis and reduce body weight gain and metabolic endotoxemia in high-fat diet-fed mice. Everard A, Geurts L, Van Roye M, Delzenne NM, Cani PD. 20 Zanoli P, Zavatti M, Rivasi M, Brusiani F, Losi G, Puia G, Avallone R, Baraldi M. Evidence that the beta-acids fraction of hops reduces central GABAergic neurotransmission. J Ethnopharmacol. 2007 Jan 3;109(1):87-92. Epub 2006 Jul 11. 21 Mol Nutr Food Res. 2009 Sep;53(9):1143-55. Hop bitter acids efficiently block inflammation independent of GRalpha, PPARalpha, or PPARgamma.Van Cleemput M, Heyerick A, Libert C, Swerts K, Philippé J, De Keukeleire D, Haegeman G, De Bosscher K.
22 J Agric Food Chem. 2009 Aug 26;57(16):7274-81. Xanthohumol from hop (Humulus lupulus L.) is an efficient inhibitor of monocyte chemoattractant protein-1 and tumor necrosis factor-alpha release in LPS-stimulated RAW 264.7 mouse macrophages and U937 human monocytes. Lupinacci E, Meijerink J, Vincken JP, Gabriele B, Gruppen H, Witkamp RF. 23 J Periodontol. 2008 Jan;79(1):174-80. Inflammatory responses of gingival epithelial cells stimulated with Porphyromonas gingivalis vesicles are inhibited by hop-associated polyphenols. Kou Y, Inaba H, Kato T, Tagashira M, Honma D, Kanda T, Ohtake Y, Amano A. 24 J Ethnopharmacol. 2007 Jan 3;109(1):87-92. Epub 2006 Jul 11.Evidence that the beta-acids fraction of hops reduces central GABAergic neurotransmission.Zanoli P, Zavatti M, Rivasi M, Brusiani F, Losi G, Puia G, Avallone R, Baraldi M.